Playful but practical dress up bibs keep both parents and toddlers happy. 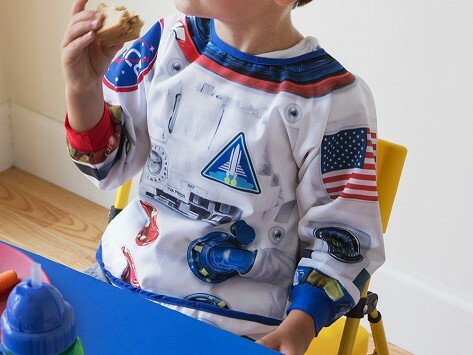 The all-over, photorealistic prints are highly detailed, engaging little ones and encouraging them to dream big—straight up into outer space. The design is a full- coverage art smock, mealtime bib (with a flip-up pocket to catch spills), and fun dress up costume all in one comfy, toddler-sized design. Dimensions: 15.25" x 0.1" x 30.5"
Not quite a baby, but not yet a big kid—the plight of the toddler. But Suitables dress up bibs are made just for toddlers, with lifelike, photorealistic prints that they’ll want to wear any time. These full-coverage, long-sleeved bibs do more than keeps things clean at mealtime. The lightweight and breathable material—with comfy, stretchy cuffs—also works wonderfully as an art smock. Parents will appreciate the easy on-and-off velcro closure and the handy flip-up pocket that catches crumbs or holds crayons. And the bibs are, of course, stain-resistant and machine washable. Matthew Davis first created Suitables for his own children. When he tested them out on other kids, they didn’t want to take them off—which any parent can tell you is the toddler gold star of approval.